A timeslot flip didn’t accomplish much. ABC: The network tried TAKE TWO in the 8PM slot and lost 0.1 to 0.4, with THE GONG SHOW moving to 10PM and holding at 0.5. MATCH GAME stayed in the middle and was steady at 0.6. NBC: TRIAL & ERROR had a 2-episode 0.6/0.5 season premiere. That was far lower than the March 2017 premiere at 1.4/1.0, which was not only in-season but had a THIS IS US lead-in, and was also below the 0.9/0.7 2017 finale ratings with a lead-in from THE VOICE. It was consistent, though, with last week’s MARLON at 0.6/0.6. 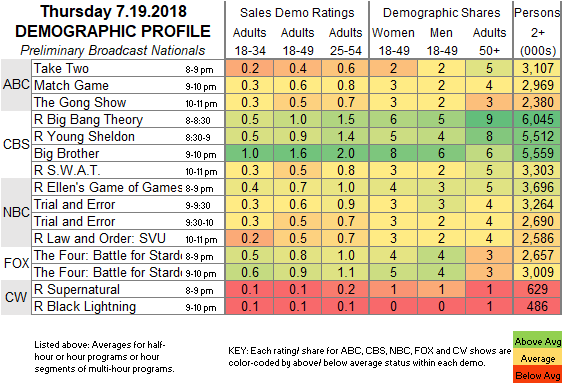 Last night, it was sandwiched between 0.7/0.5 reruns. CBS: BIG BROTHER gained 0.1 to 1.6. 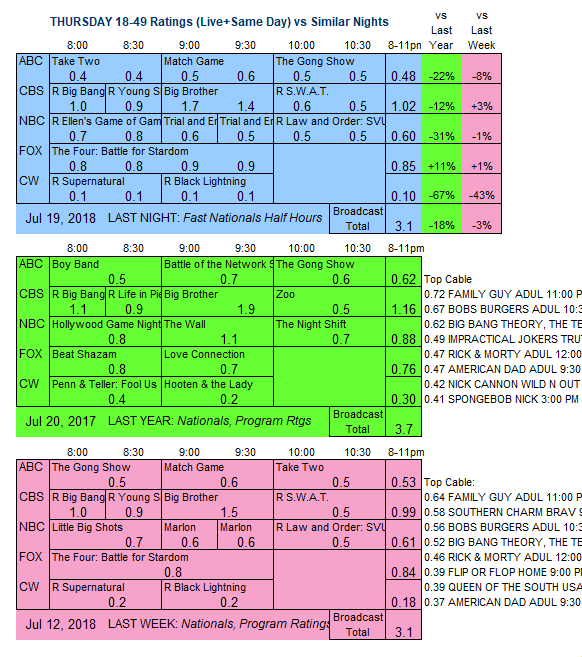 It was preceded by sitcom reruns at 1.0/0.9, and followed by a SWAT rerun at 0.5. FOX: THE FOUR rose 0.1 to 0.9. Tonight’s season premieres include WYNONNA EARP and KILLJOYS on Syfy, and OUTCAST on Cinemax.